Happy Hump Day, and it’s a great day as we get to catch up with real Belle Bride Tracey who has been busy with her DIY wedding invitations as she plans her 2017 wedding in France. Tracey: “It is really hard to believe that it is just 10 months away. It’s just enough time to fool you into thinking you have plenty of time. Well, most is going very smoothly. It seems that my in-laws are completing tasks with ease. The priest is soon to connect us with the parish in Denver, and the “traitor” (as I keep accidentally calling it because “traiteur” means “caterer” in French) is booked. 1 Collecting addresses. 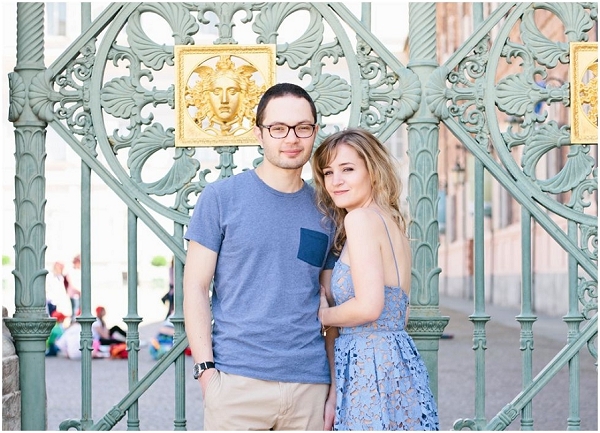 I created a website with a “Save the Date” page where invitees could submit their names and addresses, thinking it would simplify the work for me. Wrong! Six people actually used it. Haha! 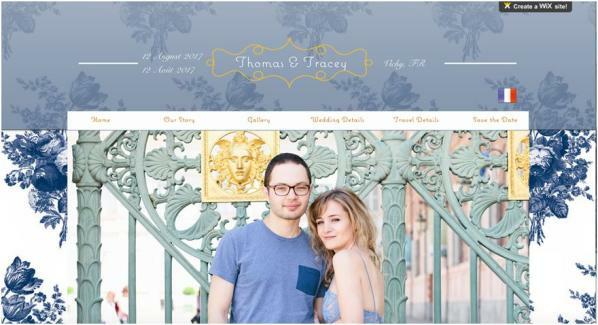 Here is a snapshot of the wedding website I created using Wix.com. The website is in French and English versions, and offers information about the wedding and travel. The “Save the Date” page will soon be changed to an RSVP form submission. 2. Getting the right materials. I immediately knew what paper I wanted from the samples I ordered, but I lost track of which codes matched which paper. Was it linen? Was it canvas? Was it 80#, 160#? Seriously, all the white ones look alike! It took me three orders to get it right. I also spent days looking but not doing anything with the envelopes and wallpaper until I decided it was because I really did not like the combo, and had to exchange those as well. Here are some recommendations so you can be smarter about it than I was…. Order samples of everything before you commit. When you receive the samples and you find the ones you like, immediately notate where you bought it and what the product code was. 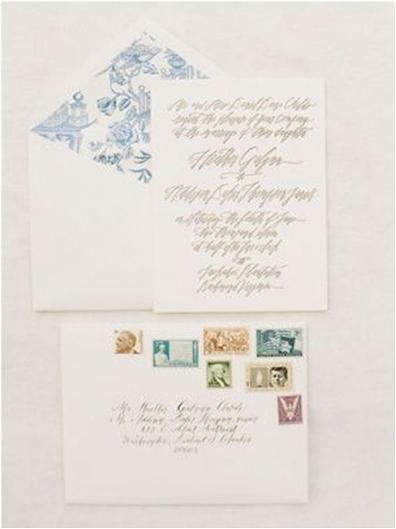 My inspiration: simple, romantic, vintage and blue. Credit: Pinterest (see on my board). Cocktail and Dinner to follow at [Place of Reception]. French: Avec leurs parents, [names of bride and groom], ont l’honneur de vous inviter à leur mariage, qui aura lieu [Date] à [Place of Ceremony]. Le vin d’honneur et la réception suivront à [Place of Reception]. 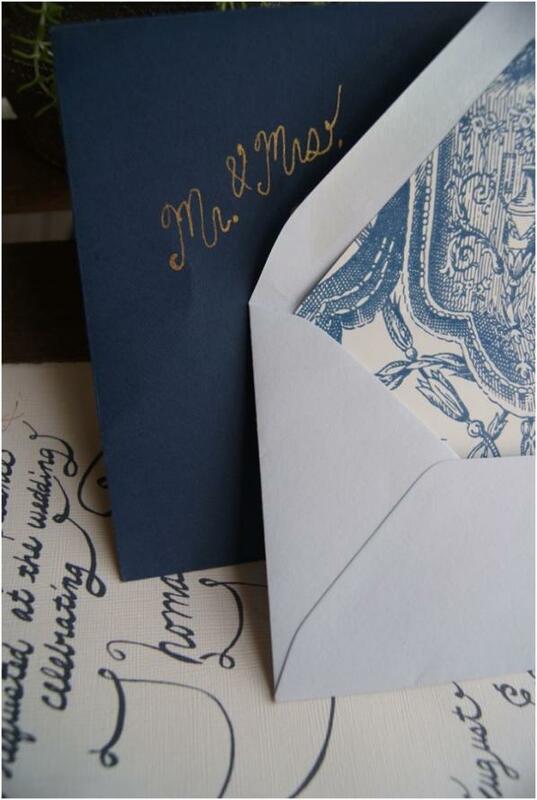 Pictures of the wedding invitations “as is” so far. Envelope liner from HomeDepot.com (York Wallcoverings), paper from paperandmore.com (White canvas cardstock 80#), Cobalt Envelopes from cardsandpockets.com. Other materials used: Pilot Parallel pen, Glass Dip Pen (gouletpens.com), Dr. Ph. Martin’s Copper Plate Gold ink, Tim Holtz paper distresser and Photoshop. Creating invitations is a lot of manual work. 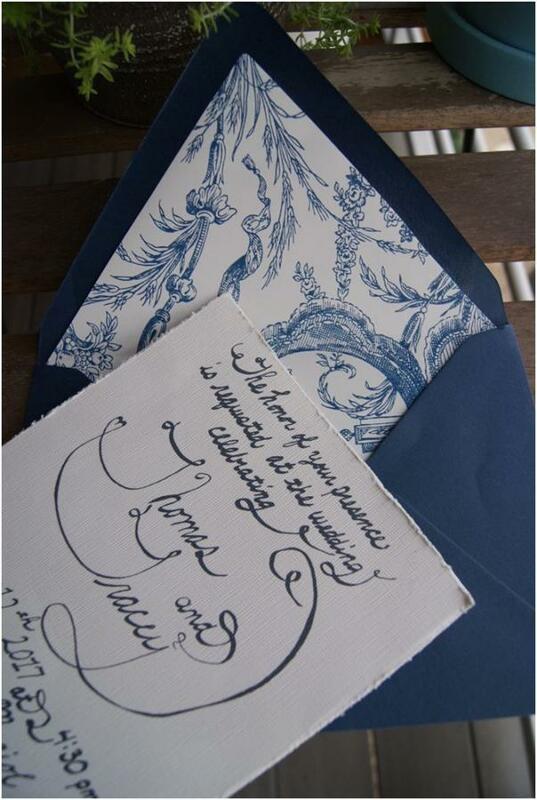 Since I want them to look handwritten but not actually handwrite 100 invitations, I wrote the invitation on white paper, scanned and created a Photoshop template that can be printed. My last advice is to keep it simple and find ways, no matter how small, to save yourself some time. 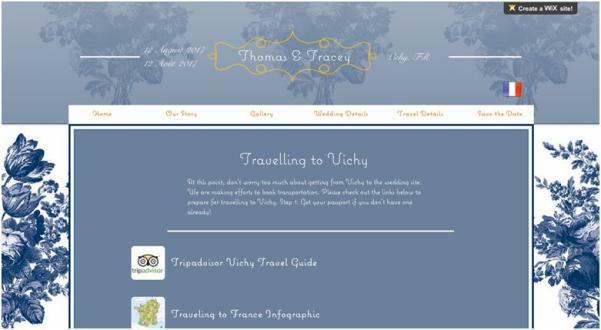 If you are looking for ideas and inspiration on planning your wedding in France, don’t forget you can catch up with Belle Bride Tracey and you can find all the Belle Brides past and present here. Nice article, sweet couple. Hope they have a great life together. Very beautiful, personal and classy.